We recommend to never jump too quickly between nicotine levels, especially when trying to reduce the nicotine intake. Why so? 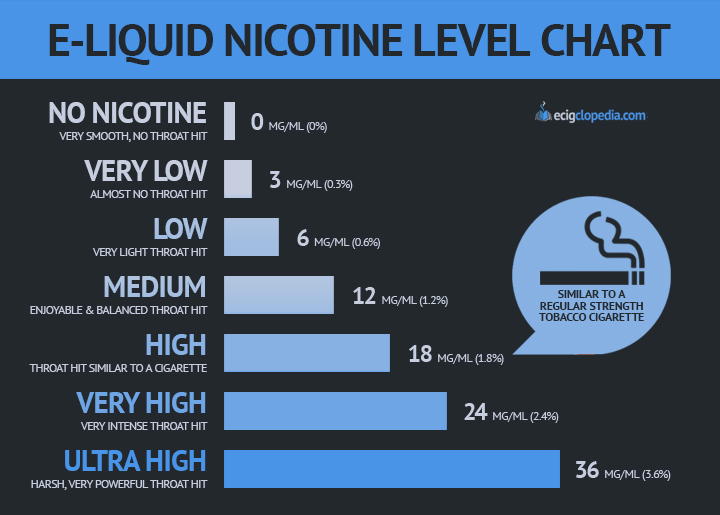 A rapid dive from, for example, 24 mg/ml to 12 mg/ml will not do you any good – you will possibly start to experience some of the nicotine withdrawal symptoms, including headaches, nausea and difficulty to focus, and the whole process of vaping will feel less satisfying for you. If your goal is to quit nicotine altogether, a better idea is to decrease the intake gradually, as suggested by a research. Both scientists and vapers will agree that this way, your body adapts the changes more easily, and the possible nicotine withdrawal effects are less noticeable. In fact, you can even mix two different nicotine level e-liquids of the same flavor to make the transition even smoother – for example, mixing a 10 ml bottle of 12 mg/ml with a 10 ml bottle of 6 mg/ml will give you an e-liquid with nicotine content of 9 milligrams per milliliter. By the way, here you can find some e-cigarette reviews!